The local newspaper interviewed me. Following on from last year's study tour of planners and officials from Trondheim, I was invited this year to take part in a conference on cycling in the city. That was two weeks ago but I've been thinking about it until now. During my three days in Trondheim, I made presentations about Dutch cycling infrastructure and also took a close look at what Trondheim already has as well as where they are heading. I've made some suggestions for improvements to designs, but overall I got a very positive impression from what is happening. Hills and Mountains: Differences between the Netherlands and Norway are obvious before landing. But there are also similarities and the same approaches can bring the same benefits. No two cities can ever be exactly alike, but sometimes it helps to find similarities. Trondheim has some obvious similarities with Groningen. For instance, the two cities have a similar population size and both have a high student population. Trondheim was of this wonderful roller-coaster cycle-path. Trondheim is certainly much more hilly. It's also spread over a larger area. The overall population density outside of the centre is closer to that of Assen than Groningen. As a result, some peoples' journeys are perhaps longer in Trondheim than in Groningen. They also have to make those journeys in a different climate. Trondheim is colder in winter than Groningen. 3.6 C may not sound like much, but it keeps the mean temperature in January below freezing in Trondheim ( -1.2 C vs. 2.4 C ) and that is certainly a challenge because ice and snow therefore will not melt away so quickly. Differences in temperature, distance and topology will of course result in a difference in the potential for cycling in any given city. Outside of the centre of the city, Trondheim really is hilly. However even in a hilly city like this, not all journeys are particularly strenuous. What's more, just because some distances are longer that doesn't mean that all journeys are longer and just because it's cold sometimes, that doesn't mean it's cold all the time. There are always opportunities for cycling. Always journeys for which cycling is a good fit. If a city makes cycling pleasant, convenient, attractive and safe then more people will cycle, regardless of difficulties like this. bridge is for cyclists and pedestrians only. Of course, Trondheim has perhaps has more than its fair share of obstacles and this will make it more difficult to achieve a high modal share for cycling than would be the case if this were a flatter, warmer and more compact city. But that's no reason not to try to achieve the highest level of cycling possible. When last measured, approximately 8% of journeys in Trondheim were by bike. This varies between 12% in the summer and 4% in the middle of the winter. These are already good figures compared with many cities elsewhere in the world. These figures are already better than many flatter, warmer and more compact places. It is believed that cycling has already grown by a fifth since the last proper survey a few years ago. The current target is to double the cycling modal share to 15% of all journeys by 2025. Given the expected differences between summer and winter, this implies a considerably higher modal share during summer. But this problem is known about and can be fixed. Maximising the potential of any city requires the same thing: investment in truly good infrastructure. I'm happy to say that Trondheim is genuinely making the required investment. 1.5 Billion Kr have been allocated for cycling in Trondheim. That's around €184 M. Of this, a fifth has already been spent and about €150M is left to spend over the next 11 years. This works out as an investment rate in cycling of €75 per person per year. That's approximately two and half times what the Dutch spend on cycling infrastructure. No country can afford to be complacent. No place can expect cycling to grow or even maintain its popularity without investment. I'm very pleased to see that Trondheim is taking this seriously. There's a lot to do and there will inevitably be some mistakes made with such an ambitious project. However, with attention to good design, Trondheim could catch up with and pass the quality of infrastructure seen in Dutch cities. The Trampe bicycle lift and "City Bikes"
Tourists taking photos at the bottom. Note how steep the hill is. The bicycle lift is probably the main reason why cyclists worldwide currently know about cycling in Trondheim. Nearly twenty years have passed since I first heard of the Trampe bicycle lift and of course I was very keen to try it out. The bicycle lift is unique to Trondheim and it really is quite marvelous. A great symbol of the importance of cycling, it's also very popular. It's popular not only with local cyclists but it's so well known internationally that this has become the second biggest tourist attraction in Trondheim. advertising not the cycling budget. Trondheim also has 200 "City Bikes" which anyone can hire for a small fee (with a low cost card, rental is free of charge). 200 bikes may not sound like a huge number, but given the relatively small population of Trondheim this works out as better than one for every 1000 residents. That's a higher ratio of bikes per person than London. Like the lift, the bike share system is a symbol. Symbols are fine but they should not consume a great deal of any city's budget. In Trondheim they do not. The Trampe bicycle lift already exists and requires only maintenance. The bike share system is paid for by a company which takes its income from advertising both on the bikes and adjacent to the bicycle docks. This leaves the cycling budget of the city for infrastructure, of which more later. Absolutely no air at all in these tyres ! Naturally, the company responsible for the bikes has tried to keep their costs down. One part of this is reduction of maintenance and they've achieved that aim in part by filling the otherwise conventional looking tyres of the bicycles with solid rubber instead of air. This unfortunately makes the bikes rather inefficient. They're also quite heavy and they have just three gears but those are lesser problems. I rode one of these bikes for almost a whole day and I went up and down many hills with it. However Mr Dunlop's invention would have made everything easier. For casual users I think it a shame that they have this extra difficulty. On the other day that I cycled I borrowed a hire bicycle from my hotel. Just as everywhere else, most people who cycle regularly in Trondheim have their own bikes. In my short time cycling I can't claim comprehensive knowledge of Trondheim, but I found that considerable effort had gone into building routes between suburbs and the city centre in the directions that I rode in. Some of this infrastructure was older and it did vary in quality. But the new investment has clearly already achieved a lot. There are many new cycle-paths. In some cases, these new cycle-paths were so new that they still even had the smell of asphalt. New cycle and pedestrian paths on the left, probably officially open by now. These take a more direct route across the top of an underpass rather than dropping to a blind corner and then climbing again as does the older shared-use path on the right. This long video shows a route between one suburb and the centre of the city. I picked the route at random. Overall this shows a standard of cycle provision which few countries can match. Starting in a residential area, I ride on older provision and some of the very latest before entering the city centre. This junction appears at 12:10 in the video above. We went back here together to look at why this junction design is inadequate. The cycle-path is too close to the road, the corner radii are too large, sight lines for drivers and cyclists are not what they could be. The junction would also benefit from being a raised table to discourage high speeds. While we stood there, these two drivers demonstrated how injuries can result from this design (this cyclist was not injured). One of many bicycle roads in residential areas. These provide no good through route by car, but are usable to make journeys by bike. Some of the newer infrastructure in Trondheim seems to go to unnecessary lengths to make cycling more difficult than it ought to be. For instance, in this location we went through a tunnel under a railway line, then over this high bridge which led us back down into a valley before we had to ride back up a steep hill. As well as designing direct routes on a 2D map, there needs to be emphasis on trying not to send cyclists up and down quite this much. 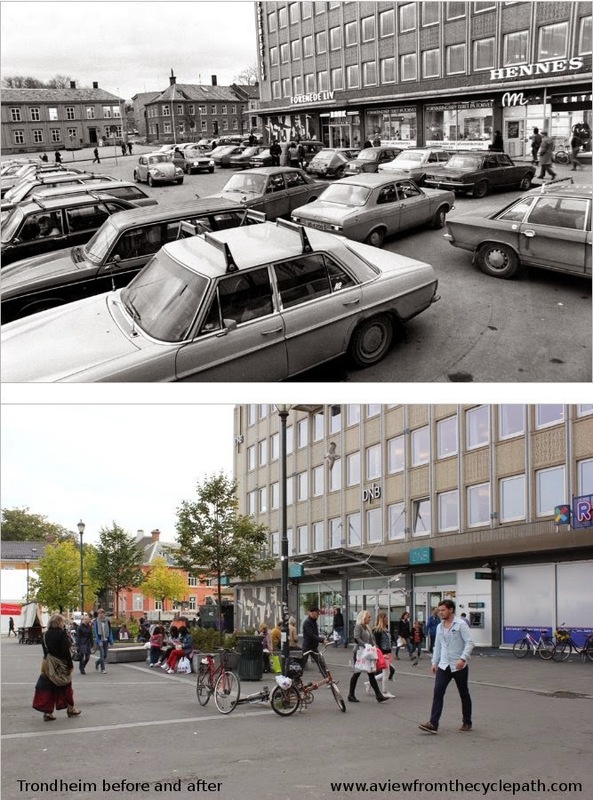 Just as in the Netherlands, a process began decades ago in Trondheim in which streets were emptied of cars. Car parks became pleasant squares. What's more, Trondheim also succeeded in excluding much of the through traffic which used to go through the centre of the city (see the next section to find out how this was achieved in a city where there was no space to build a ring-road). The result is a much more pleasant city centre. People very obviously feel at home there. However cyclists benefited almost by accident. It is within the city centre that I think Trondheim has its greatest challenges. A wide and busy street with no room for a cycle-path ? That's only because so much space is allocated to motor vehicles. At present both cyclists and pedestrians are squeezed to the side. Timid cyclists use the pavement (sidewalk) while the brave ride amongst the motor vehicles. Neither solution is ideal but it does allow everyone to go everywhere. Just as in every other place, many roads in Trondheim are still considered by some people to have "not enough space for cycle-paths". This really comes down to what you want to achieve. Trondheim's city centre roads are in many cases no longer very heavily used by motor vehicles but there those vehicles still have a great deal of space allocated to them. In some cases this is because of a conflict between wanting to provide bus lanes and cycle paths. At the moment, the allocation of space on many of Trondheim's city centre streets is inequitable. Cyclists and pedestrians are numerous but have very little space so there are some conflicts. Cyclists and pedestrians alike find themselves waiting an awful long time for a green light even when roads are almost empty. As a result, crossing on red is very common. In many cases, Norwegian traffic lights are set up so that a driver turning right will have a green traffic light at the same time as a pedestrian or pavement cyclist going straight along the same road. Traffic lights should never create dangerous conflicts in this way. When I commented about this, I was told that crashes and injuries occur in Trondheim due to this conflict. In Assen we don't have that conflict built into traffic light junctions and it results in the junctions being much safer for everyone. Unfortunately, this same conflict can still be found in some other places in the Netherlands, even at newly constructed junctions. In Norway she is not. But it's not at all convenient. A subject which causes much consternation in many countries is that of cyclists riding bicycles on the pavement (US: sidewalk). In Norway this was legalized decades ago. I've often wondered what the effect would be of allowing people to cycle on the pavement, and now I know. There are pros and cons of this approach. The main benefit is that the pavements provide an almost complete network so make cycling to almost any destination into a possibility even for the most timid riders. The problem is that it's not really either convenient or safe for cyclists to do this, certainly not if they want to ride at any speed. any place by bike is an advantage. I wanted to ride as the Trondheimers ride so I tried riding on the pavements in the centre of Trondheim. Once I got past my feeling of this simply being wrong, it was actually quite freeing. It is useful if you are not in a hurry. You can go anywhere on a bike in Norway and people don't wag their fingers at you for being where you shouldn't be. However, there's always that caveat: "If you're not in a hurry". It's not a substitute for specific cycling infrastructure because time is important for most people. convenient, but it does work. Note that people even cross the road on bikes as if they are pedestrians. Drivers don't have to stop for cyclists on zebra crossings as they do for pedestrians, but many drivers will stop. At crossings with traffic lights, that is not a problem, but it's not really convenient. I should point out that there are good reasons why zebra crossings don't work well for cyclists. For safe operation they rely upon pedestrians being slow. A driver has to stop only if a pedestrian is very close to or is already on the crossing (local laws vary). This does not work safely for cyclists because higher speeds result in the reaction time being greatly reduced. I also tried riding on the roads. This allowed making much better progress. If I lived in Trondheim I'd probably cycle on the roads most of the time myself. However even though I was there for just a few days, a couple of drivers tooted me for no particular reason (this was not very aggressive, I'm not used to being tooted at all in the Netherlands). When riding on the road, I felt rather like a member of a minority. In fact, doing this this felt much like cycling in a country like the UK where cyclists most certainly are in a minority. cross at different times. All-inclusive infra is possible. Within the city, faster cyclists almost exclusively stick to the roads because they can make faster journeys that way. I understand why they do this because I would do the same. But we're members of a minority which will always be small. It is due in large part to the pavement cyclists that Trondheim has such a high cycling modal share as it does within the city centre. These pavement cyclists are already numerous, but their journeys are not made convenient enough. If it were easy for less confident cyclists to make more of their journeys by bike then this would enable real growth to occur. What's more, if good enough cycling infrastructure is built then this will become the natural home of the confident cyclists as well, just as it already is outside of the centre. That everyone chooses to use them rather than some continuing to ride on the roads is an indication of quality for all cycle paths. Due to pavement cycling being legal, there is no legal or social problem associated with cyclists using pedestrianized streets like this one. These are great. They work very similarly to Dutch pedestrianized areas which allow cycling. The problem is that the infrastructure to link them is in many cases missing within the centre. To me it seems quite obvious that the city centre not only has space for proper cycling infrastructure where it is needed alongside busy roads to link pedestrianized streets in the city centre to the cycle-paths and bicycle roads outside the centre, but that the residents of Trondheim would benefit greatly from it. Trondheimers already cycle a lot, and they would cycle more if cycling were made more pleasant, more comfortable, more subjectively safe. The pros and cons of pavement cycling. There's a real benefit in creating network which is more accessible to many than the roads, but it doesn't work well to have main cycling routes combined with main walking routes, as illustrated by the conflicts which occur on a busy shared-use bridge in Trondheim. Note that the bridge had undergone maintenance just before I made my video and that a painted line is usually used to separate modes. Some comments suggest that this is not entirely successful. What's happening in Trondheim is not only about cycling infrastructure. Much of the through motorized traffic which used to dominate city centre streets has disappeared. Just how it's been made to disappear is quite remarkable. Trondheim where roads have been diverted underground. The centre of Trondheim is surrounded by the sea on one side and hills in the suburbs on the other. Without any obvious place to build bypasses on the surface and with no desire to build bridges over the city centre, Trondheim has instead built an extensive network of tunnels under the city. These tunnels are layered on top of one another and feature road junctions such as roundabouts. All of this is out of sight from the surface. Cyclists are not expected to ride in these tunnels. Indeed, it is not allowed to cycle through these tunnels. Cyclists have the surface. There was once a busy road here but the road is now underground and this area now provides a traffic free cycle-path and a play area for children. In the 1960s, this river was buried and a road was built here. The road has now been buried and the river has come back to the surface. and placed on top of new basements. Between the airport and the city, my bus travelled through at least 10 km of tunnels through rock. This is a difficult enough task but the city is not built on such firm foundations and digging through the softer ground under the city without disturbing buildings is considered to be much more difficult. Difficulty isn't standing in the way of improving the city. In some cases, entire buildings had to be moved several kilometres away during construction of tunnels. After the tunnels were completed, the same buildings were brought back to their original positions. Quite apart from the removal of much of the traffic in the area which they live in, residents of these buildings benefit from new foundations and better basements than they had before. Much of the new and good work across the city is the work of Miljøpakken ("Greener Trondheim" - though it translates literally as "Environmental package"). This council initiative has been quite clever at marketing itself. Their logo is easily recognized and often seen. It's a symbol of progress within the city. About 60% of Miljøpakken's funding comes from road tolls. There is a target to reduce journeys by private car but this is not happening in an aggressive way. There is spending on things which will improve the lives of everyone in the city, including drivers. When works are carried out on behalf of Miljøpakken, everyone is informed that this is the case. Where a street is being pedestrianized, the logo is clearly visible. On a cycle-lane: Thank-you for cycling. Keeping on the right side of the public is essential for an organisation which is changing the city. Trondheimers are seeing benefits from what has been done and that is why most people are in support. One of the successes in Trondheim in recent years is the increase in school cycling. We visited a bicycle road (a road dedicated as a through route by bicycle but not as a through route by motor vehicles) as part of the tour around Trondheim and while we were there, this group of school children cycled past together. It was clear that my hosts were as surprised as I was. "This didn't happen five years ago". For teachers to feel confidence enough to take an entire class cycling like this, as they regularly do across the Netherlands, and for parents to feel confident enough to allow it, requires a high level of subjective safety. School cycling is increasing in Trondheim, and also in other parts of Norway. When cycling is made into an attractive form of transport, people are attracted to cycling. What it takes is removal of motor vehicles from where cyclists must ride. The higher the quality of this removal, the more cycling results. It's important to have a comprehensive grid of high quality infrastructure as non-existent or dangerous links are not attractive. Norway allowing pavement cycling has enabled the country to maintain a higher cycling modal share than it would have without pavements providing usable but low quality links, but to grow further Norway too needs proper infrastructure. I'm happy to say that Trondheim at least is well on its way to achieving this. This month we have two more study tours booked by people from Trondheim. It's extremely positive that there are so many people taking a serious interest in growing cycling in Trondheim and across Norway. As with other study tour groups, we will take a close interest in what really works to make cycling more convenient and accessible to the population and also take a close look at those things which do not work in order to avoid mistakes being repeated. I've not often flown to cycle. Earlier this same year I had also been invited to go and talk in Australia and I refused that invitation on the grounds of the environmental cost of making the journey. A few weeks after I made this trip to Trondheim I was invited to go back again in order visit Oslo, but I refused that trip as well. I think the Trondheim trip may have been positive overall, but it's very difficult to be certain of that. We all need to travel less. Online resources can show people how to build cycling infrastructure. I came back to this theme in 2017 and in 2018. Norway was not always a wealthy country. Their current wealth is in large part the result of having discovered North Sea oil in the 1960s. It helped enormously that the government of Norway was dedicated to flattening out income distribution so that everyone in the country would benefit from this windfall. The result is the high standard of living which Norwegians benefit from. It's nice to see you being satisfied by someone else's efforts to make their place become more bikable. Trondheim has obviously made your Dutch-spoiled self satisfied with some of its infrastructure. Yes, I also noticed some omissions and overlooked details you noted in your videos and the blog. Still, what Trondheim has done is better than what is available in Bergen County (NJ) --here in America. I would say that Trondheim is about one or two notches below New York City as far as developed bicycle infrastructure, but is on the way to being Dutch--level evolved in its attitude about bicycles. And as for pavement (sidewalk) cycling... the Norwegians are being practical about the physical realities about the bicycle and the political realities about their budgeting. They did not have the double crisis that the Netherlands had: Kindermoord and Mideast Oil-price Shock... 10 months apart. There is one other country, I know of, that is pragmatic about bicycles on the sidewalk: Japan. Check them out one of these years.